3 years ago on 25 November 2012 – On his first return to the Liberty Stadium since his departure, Brendan Rodgers cut a frustrated figure as Michael Laudrup’s men held Liverpool to a goalless draw in front of a 20,621 crowd at the Liberty Stadium. 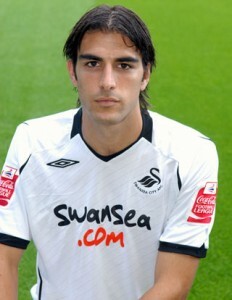 It was the Swans first clean sheet in 11 matches and the point saw them rise to 8th place in the Premier League table. 7 years ago on 25 November 2008 – The eigth placed Swans were denied all three points at the Ricoh Arena as Coventry City scored an 87th minute equaliser to cancel out Jordi Gomez’s goal in the Coca-Cola Championship. 15 years ago on 25 November 2000 – Despite languishing near the foot of the Nationwide League Division Two table, the Swans fought back from 3 nil down to draw 3-3 at Cambridge United. Two goals from Giovanni Savarese and an injury time equaliser from Steve Wakin gave John Hollin’s side a share of the points, in front of the 3,296 crowd at the Abbey Stadium. 20 years ago on 25 November 1995 – The Swans held promotion chasing Notts County to a goaless draw in front of a Vetch Field crowd of 2,327 in Endsleigh Insurance League Division Two. 26 years ago on 25 November 1989 – The Swans lost 2-0 at Barclays League Division 3 leaders Bristol Rovers. Manager Ian Evans handed a debut to Scottish player John Hughes, whom he had signed just two days earlier from Berwick Rangers for a £70,000 fee. 28 years ago on 25 November 1987 – The Swans won 4-0 at Cwmbran Town in the Welsh Cup 3rd Round. 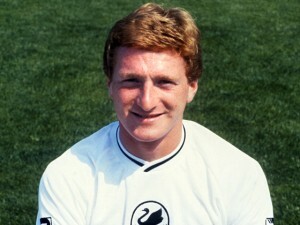 The 1,098 crowd saw Colin Pascoe, Alan Knill, Paul Raynor and Sean McCarthy score for the Swans. 35 years ago on 25 November 1980 – The 2nd Dvision Swans beat Caerleon 5-1 at the Vetch Field in the Welsh Cup 3rd Round. Goals from John Toshack, Neil Robinson, Robbie James (2) and Tommy Craig, ensured that the 1,778 Vetch faithful went home happy. 37 years ago on 25 November 1978 – The Swans eased into the 2nd round of the FA Cup after beating Hillingdon Borough 4-1 at the Vetch thanks to goals from Robbie James, Jeremy Charles (2) and Alan Waddle. A crowd of 7,824 watched the game. 43 years ago on 25 November 1972 – The bottom of the Football League Third Division Swans had to settle for a point at Halifax Town despite Herbie Williams giving the Swans an 18th minute lead.